Portable fire extinguishers must be inspected and tagged on an annual basis. Dry chemical fire extinguishers require special maintenance known as “6 Year Maintenance” which, as the name implies, requires a full internal inspection of the unit every six (6) years. This procedure includes removing and replacing the fire extinguishing agent. These units must be hydrotested every twelve (12) years. Carbon Dioxide (CO²) fire extinguishers do not require six (6) year maintenance but must be hydrotested every five (5) years. Please see National Fire Protection Association (NFPA) Standard 10, Portable Fire Extinguishers, for detailed information. All repair work and hydrostatic testing is done in our DOT certified maintenance shop by Fireline employees. We do not subcontract any of our services. 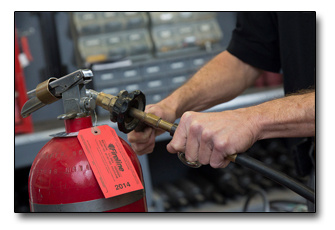 In fact, other fire protection companies use Fireline for fire extinguisher repairs and container certifications.